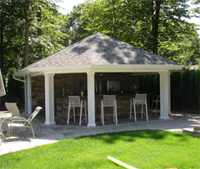 Harbor Hills Construction, INC. offers more than just “home” remodeling. You can now build the perfect detached garage, or two level deck with Jacuzzi or summer cabana to entertain guests at your home. From Concept To Completion We Take Care Of The Permit, Site Preparation, Concrete Slab, And Construction Of The Building. We Leave Nothing Behind Except Your Building!! !